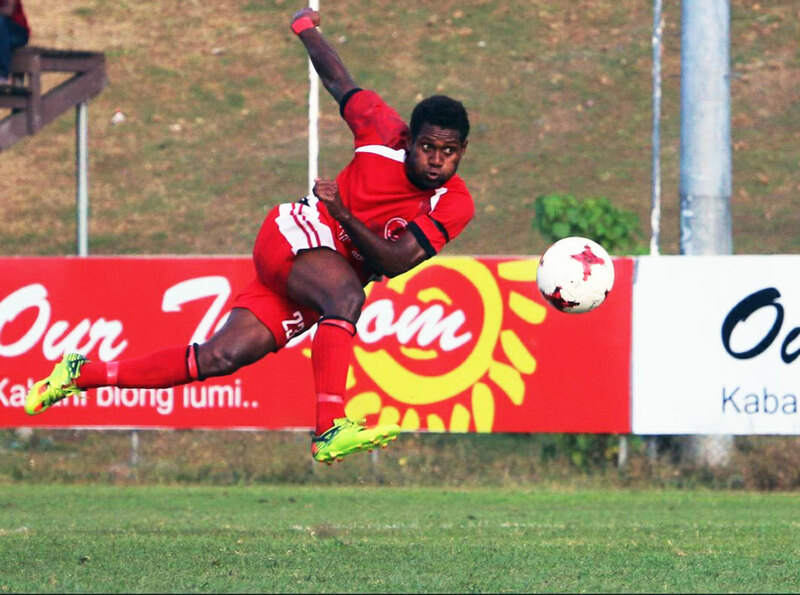 Solomon Islands international Gagame Feni in action for the Solomon Warriors in the S-League. Solomon Warriors have topped the Telekom S-League to qualify for the OFC Champions League 2018 with just one match remaining in the competition after an impressive record which has seen them win 11 of their 13 games in the 2017/18 season. They will be joined in the region’s premier international club competition by Marist FC after they put themselves out of Henderson Eels’ reach at the weekend. Solomon Warriors will return to the regional stage after a one-year hiatus, and coach Moses Toata is delighted his team gave their all throughout the season and should enjoy their success. “To my warriors, you boys did it,” he said. “You were given a huge responsibility, faced many challenges. You didn’t run from them, you ran over them. Toata said the opinions of many were that his side may not have had what it took to get back into the Champions League. “You showed many who followed you that doing a great job is not always about impressive innovations, sometimes it’s only about plain dedication and hard work,” he said. That hard work included a thrilling 4-3 victory over the defending champions Marist back in September. Marist got their own back in November when they pipped the league leaders 2-1 to push their way back up the ladder to second. That’s where the side remains after a season that included nine wins, two draws and two losses. Marist celebrate their return to the OFC Champions League after a 2-0 win over Kossa. Marist captain Henry Fa’arodo, also the club’s leading goalscorer this season, said the 2-0 win over Kossa in their most recent match was an important one for the side. “It gets us through to another Champions League and it also shows what we are capable of achieving when we put the effort in,” the 35-year-old said. “I think the last few games have been a true test of character and attitude and I hope the boys, the team, can learn from this situation. For me, the performances from the boys have been outstanding. Not only have Marist qualified, but as the S-League runners-up they will join the Solomon Islands Football Federation in hosting Group D of the OFC Champions League 2018, welcoming Team Wellington, AS Magenta and the Qualifier runners-up to Honiara. Solomon Warriors will travel to Tahiti where they will play AS Dragon, AS Lossi and Erakor Golden Star.